Welcome to Villa Torino Apartments! Our central downtown San Jose location, exquisite apartment features, spacious floor plans and luxurious resident amenities are just part of the reason living at Villa Torino is so desirable. We have 1, 2, and 3 bedroom floor plans with large living areas perfect for entertaining, generous bedrooms, plush carpeting throughout, and tiled kitchens and baths. 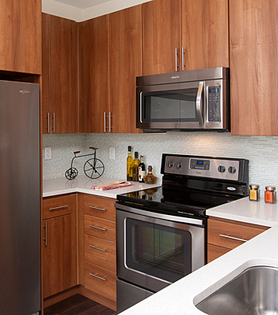 Select residences feature separate dining areas, well-designed kitchens with modern appliances and cabinetry. When you step outside your front door, you can enjoy our community amenities and services designed to make your life easier. Take a dip in our resort-style pool complete with spa, get in a workout at our fitness center, or just spend some time relaxing or working in the resident lounge. Great urban adventures are just a heartbeat from your front door in San Jose and with access to the Light Rail. Meet your friends at San Pedro Square for a drink and dinner or grab some fresh produce to create your own dinner party at the weekly Farmers Market. Catch a show at the Center for the Performing Arts, cheer for the Sharks at SAP Center, and visit the Tech Museum. If you prefer to stay outdoors, walk or bike at Guadalupe River Park where you can enjoy northern California’s fantastic scenery. Come find your perfect new home by scheduling a tour today. After five years, this is still a great place to live! Thought about moving? Check out this place! Everything is awesome here! Come have a tour! Great place! Check it out! Great place to live in downtown SJ! FOR A LIMITED TIME WE'RE OFFERING MOVE-IN SPECIALS ON OUR SPACIOUS ONE-BEDROOM and 2 bedroom RESIDENCES. GET THEM WHILE THEY'RE HOT!